Oxygen is the single most important substance to life. All-natural Boost Oxygen can help fight oxygen deficiency with no caffeine and no calories! Oxygen deficiency symptoms include fatigue, stress, loss of energy, jet lag, and lack of focus and can be caused by physical activity, stress, poor air quality, travel, toxins and many other factors. Oxygen directly fuels 90% of all body and mind functions. The average purity level of Oxygen in the air is 21%. 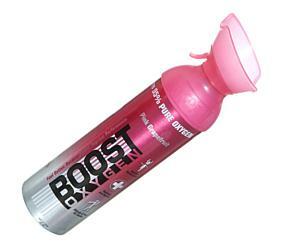 BOOST Canned Oxygen is 95% Pure. Pro Athletes regularly use supplemental oxygen. Oxygen is also commonly used by mountain climbers, weightlifters, spas, universities, casinos and hotels worldwide for a variety of benefits both physical and mental. Oxygen WORKS. Boost Oxygen is all-natural, and contains no caffeine, no calories or any other unnatural stimulants. Eat Nutritionally. Keep Hydrated. Stay Oxygenated. 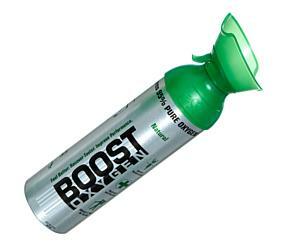 Enjoy your own portable and personal oxygen cans with Boost! Multiple Use 22 oz Can: Contains over 6 Liters 95% Pure Oxygen =120-150 Inhalations.